One of the biggest challenges facing football coaches is instilling discipline into players from an early age. These efforts it must be said, can be hampered by the media coverage given to unsavoury incidents on the field of play in the game’s top flight. Given the pressures on professional players, it is no surprise that flash points occur, although that is not to turn a blind eye to the antics of some of the serial offenders. The problem for coaches is that when viewed by impressionable eyes, these antics can translate onto the field of play of a range of age groups. The results are not only injury to opposing players but a breakdown in the shape of the team and the performance of individuals that can only result in defeat. However, the result of the game is secondary to the safety of all those taking part. Players must be made aware of their responsibilities and the real consequences of foul play on the pitch. 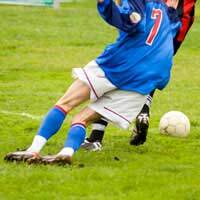 Television pitches can only relay the visual results of a foul – for example, a player rolling around in agony – and not the physical pain and injury that is felt by the player in question. And not only can indiscipline have physical consequences for opponents; a deliberate attempt to injure another can often result in the perpetrator themselves being hurt, either when executing the foul or as a result of retribution carried out by other members of the opposing team. Players need to learn to channel their competitive aggression in a positive way. Referees rely on a certain level of self-policing on the part of both teams. They only have one pair of eyes and ears to rely on, along with those of their assistants. If a game degenerates into random acts of foul play and retribution, then a flurry of red cards may result in the match being abandoned, to the detriment of everyone concerned. In short, everyone is a loser. Now let’s tackle the second consequence of ill discipline: poor performance. Not only do players have to concentrate on their own movement and positional play, and that of their team-mates, they have to be constantly aware of their opponents’ movements and the potential threat they pose. Once the mind becomes clouded with anger about an injustice, whether real or perceived, then that vital concentration is quickly lost. Positional play will suffer, passes will begin to go astray, and team-mates will themselves become frustrated because the contribution made by the individual in question is having a negative effect on team play. While a player is charging around, seeking to settle personal vendettas, they will be likely unaware of their own negative contribution and its effect on their team-mates. Again, the fun that must be part of playing sport is quickly lost in the heat of the moment. Every individual involved in a game of football, whether they are a player, coach or official has both a responsibility to each other and to the sport themselves. And each must be reminded of that fact when they step out of line. Everyone is allowed to make mistakes but they must be made aware that even those blessed with an abundance of skill only end up scoring an own goal when they lose their self-discipline.